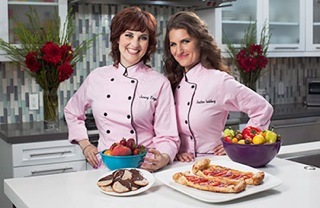 Spork Foods’ Heather Goldberg and Jenny Engel recently returned from their nationwide tour with GO Veggie! They’ve been on the road giving demos, sharing recipes, and getting people excited about the wonderful things you can make with vegan cheese alternatives. Heather Goldberg and Jenny Engel are the founders of Spork Foods, a LA-based gourmet vegan food company that offers vegan cooking classes, consultations, etc. They have lots of experience working with organic, healthy ingredients, and creating delicious, innovative vegan dishes. Heather and Jenny sat down for an interview with LookyTasty.com to tell us more about Spork Foods and their collaboration with GO Veggie! How long have you been vegan? What motivated you to adopt a vegan diet? We have been vegan for over 14 years now! Both of us were inspired by what we learned in college (Heather up in San Francisco and Jenny over in Santa Cruz) as Environmental Science students. We slowly made the connection between the environmental damage we were contributing by eating meat and dairy. From there we became animal activists and Spork Foods was born. How did Spork Foods start and what was the inspiration behind it? We have always loved to cook, and when we grew up, the kitchen was the focal point of our house. We constantly hung out in the kitchen while our family prepared meals and because of that we realized that food was such an important element with regards to bringing a family together. When we went vegan, there were very few delicious alternative foods, like vegan cheeses and meats out there – so if we wanted any of those comforting substitutes – we had to get cooking. We didn’t want to sacrifice the flavors and textures that we loved just because we chose a plant-based lifestyle, so we dove in and started experimenting in the kitchen. Spork Foods started because we always wanted a sister business, where we could eat lunch together every day! Not only that, but we love the idea of empowering people to feed themselves with nourishing, delicious vegan foods. We loved the concept of teaching because you get to explain not only how to make the recipe, but what the ingredients are doing in your body, and where they come from. For example, did you know that all citrus originated in Asia, or that basil can help cure a tension headache? These are the things you don’t get to explain if you are in a restaurant setting, so a cooking class is a great way to convey this information and also feed people delish vegan food. We knew that Spork Foods had to combine all of our passions, so we opened up shop – teaching and feeding people vegan cuisine. Fresh organic produce! It is so pure and clean, you hardly have to touch it to make it delicious! What are five essential ingredients or foods in your kitchen? and why? Vitamix blender for cashew cheese, pastry whisk for desserts, a great heavy pan for even heat, we love non-toxic scanpans, amazing spices for flavor- we love Frontier, lastly a great chefs knife for the obvious- we love Shun! What brought you to get involved with GO Veggie!? GO Veggie! found us while reading the LA Times! An article had just come out about our online classes, www.sporkonline.com, and they called us up and we immediately knew we were the perfect match. We have been working together for a number of years now. What is your favorite GO Veggie! product and how do you like to enjoy it? Our favorite product is the cream cheese line. It is such a crucial ingredient for our cooking because it shows non-vegans that they can still have the cheesecakes, bagel and cream cheese, etc. and that they don’t need to sacrifice flavor to make this lifestyle change! Where do you find your inspiration in developing or recreating recipes? We are inspired by the seasons, creating more comfort foods in winter and lighter dishes during the summer. We are inspired by what’s in season at the time as well! What do you think are upcoming trends in vegan cuisine? Upcoming and ongoing trends- eating your greens. A vegan skeptic is coming over for dinner. What will you prepare on the menu? We would prepare something like GO Veggie! Parmesan Arancini, and something like a Crunchy Peanut Butter Chocolate Mousse for dessert, with lots in between. These dishes are covertly vegan and delicious, so they will appeal to anyone! Would you like to share a recipe with our readers?